Thermoplastic honeycomb technology specialist EconCore has joined forces with Diehl Aircabin to develop next- generation solutions for aircraft interior modules during a European Commission funded project. The two companies envisage a new highly cost-effective process for creating modules by thermoforming and functionalizing mono-material sandwich panels in a single step. 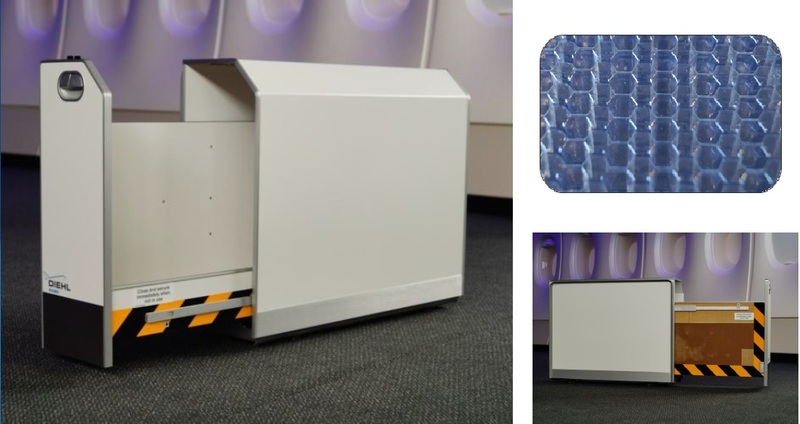 The partners have produced a prototype of an aircraft stowage unit which will be presented at the Composites Europe 2017 exhibition in Stuttgart on September 19-21. Visitors will be able to see it on the stand (6E12) of EconCore’s daughter company - ThermHex Waben. EconCore and Diehl Aircabin, a division of Diehl Aerosystems specializing in cabin modules, crew rest compartments and air ducting, were supported by consortium partners from industry and academia during the four-year InCom (Industrial Production Processes for Nanoreinforced Composite Structures) project, which concluded at the end of August. The two companies now plan to work together on an independent basis. The new development brings together EconCore’s honeycomb production technology with a special grade of polycarbonate that has outstanding fire-smoke-toxicity performance. Test reports confirm the excellent fire resistant behavior of the final sandwich structures, which cost significantly less than aramid and other conventional honeycomb solutions. Diehl Aircabin, EconCore and other partners of the INCOM project consortium wish to thank European Commission for its support. EconCore, based in Leuven, Belgium, provides technology for the continuous production of honeycomb sandwich materials. The unique ability to produce rigid but lightweight panels within a cost-efficient, integrated high-volume production process is licensed by several companies over the world. The fast, versatile, continuous thermoplastic honeycomb production process allows users to produce sandwich materials for various applications including automotive, transportation, building and construction, industrial packaging/graphical displays, furniture and many others at minimal cost, weight and environmental impact. For more information, please visit www.EconCore.com / LinkedIn / Twitter. Diehl Aircabin is part of Diehl Aerosystems, a first-tier supplier for avionics and cabin integration and an important partner for the international aviation industry. Its customers include major aircraft manufacturers such as Airbus, Boeing, Eurocopter, Bombardier and Embraer. Diehl Aircabin's product portfolio embraces high-quality synthetic components and cabin fittings for commercial aircraft, including overhead baggage bins, rest rooms for the crew, and parts for the air ducting as well as retrofit-solutions for aircraft operators. Diehl Aircabin and EconCore are developing aircraft interior modules based on thermoplastic honeycomb.